If you’re lucky enough to live on or near the beach, you’ll want great seaside plants and flowers to show off in your great location. Choosing seaside plants and flowers is not difficult, once you learn what to look for when picking out plants for a seaside garden. Many seaside landscape areas are in a full sun location, and shrubs and trees for coastal usage have to be tolerant of sea spray. High winds are common at the beach and soil is sandy, meaning water retention can be a problem with plants for a seaside garden. Yaupon holly (Ilex vomitoria) and wax myrtle (Myrica cerifera) shrubs are widely used on the ocean-facing side of beach gardens, having a high salt tolerance. Both tolerate full sun to light shade, and both are long-lived specimens that get tall enough, 10 to 20 feet, to form a barrier or privacy hedge. Larger trees with a high salt tolerance include the Eastern red cedar (Juniperus virginiana) and the Southern magnolia (Magnolia grandiflora). Combine these with highly salt tolerant grasses, like maiden grass (Miscanthus sinensis) or Muhly grass (Muhlenbergia capillaries), which grow well in the well-draining, sandy soil found in beach areas. These are some, but by no means all, of the best seaside garden plants for the garden with no barrier to the ocean. Work in compost to improve soil and help with water retention. Man-made fences offer some protection from the salty spray. Use overhead irrigation often to remove salt from foliage. 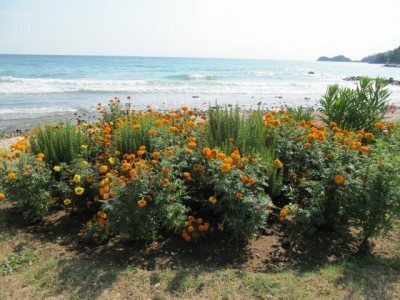 Read more articles about Seaside Gardens.